Tonawanda, N.Y. - When was the last time you noticed how the vehicles in your fleet looked? Are they sparkling clean or are they dusty and dirty? If they haven't been cleaned in a while, it may be time to schedule a wash, not just because they 'look dirty' but also because a filthy fleet can hurt more than you may realize. "It's not just about aesthetics," said Christopher Miller, vice president of E-ZOIL, manufacturer of performance-enhancing fuel additives and cleaning solutions. "The dust and dirt that vehicles accumulate on exterior surfaces while driving around can pave the way for many problems, including paint peel-off and rust buildup." According to Miller, everything from the scorching sun, driving rain, blowing dust and dirt, tree sap, not to mention bird droppings, have a negative impact on a vehicle's paint and clear coat. In areas that experience snow in the winter, road salt is the worst enemy, while in places closer to the ocean, fleets can show the abrasive effects of salt in the air. The paint and the clear coat not only make vehicles look clean and attractive, they also serve to protect the metal and the components underneath. If grit collects on a vehicle, a single scratch can gradually wear off the paint over time, and eventually, expose the metal underneath. If contaminants find their way into the nooks and crevices of a vehicle's body panels they can cause rust to start and once rust starts, it only grows. Rust is most harmful when it starts in the undercarriage, which houses many moving mechanical parts, where it is not visible. Furthermore, when dirt settles on the windshield, the rear window or the side view mirrors, it can increase blind spots and compromise safety. Finally, a dirty fleet can communicate the wrong message about a company. Some truck fleets, for example, are well-known for going the extra mile when it comes to keeping their vehicles clean. When their trucks or buses are seen around town it communicates a positive message to existing and potential customers. "A regular washing schedule with high performance cleaners is critical to the maintenance and longevity of your fleet," Miller advised. "High performance cleaners containing high concentrations of specially formulated detergents can remove road film and diesel smoke, cause no water spotting and are safe to use on all surfaces. They are also biodegradable." For more information on E-ZOIL, phone 716-213-0106 or visit www.ezoil.com. 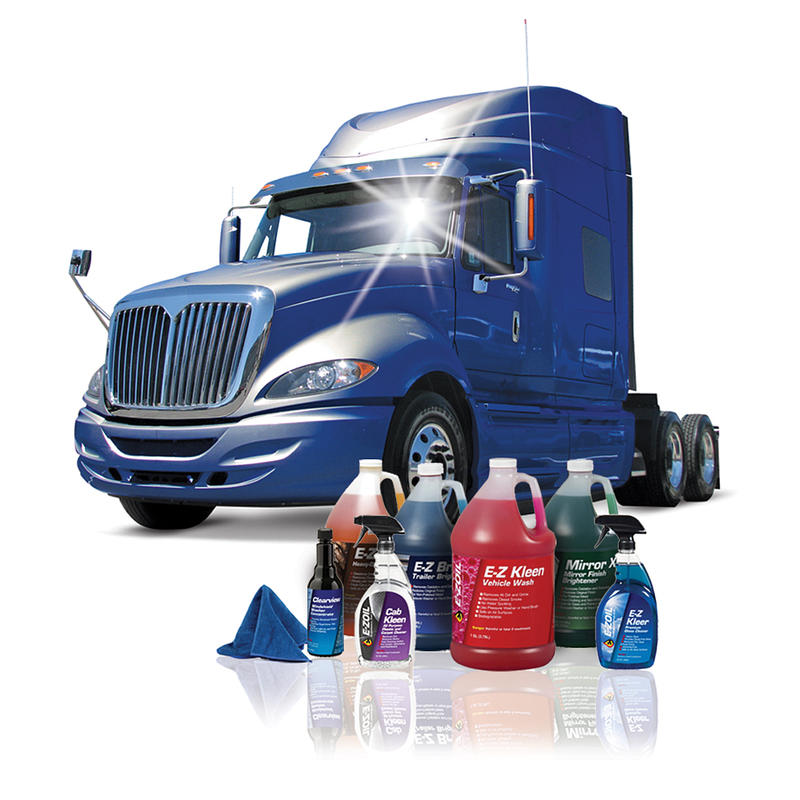 Founded in 1980 with headquarters near Buffalo, New York, E-ZOIL manufactures a complete line of performance-enhancing fuel additives and cleaning solutions for fleet owners, owner-operators and consumers to protect their diesel vehicles and equipment. E-ZOIL specializes in highly concentrated formulas developed by the company's in-house chemists and backed by over three decades of expertise. E-ZOIL products improve vehicle power and mileage, reduce costly breakdowns and downtime, assist with preventive maintenance and enhance and protect vehicle appearance. For more information, visit www.ezoil.com.